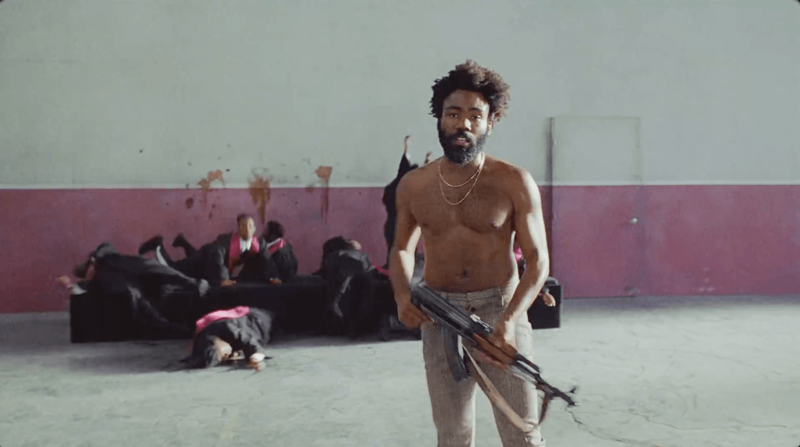 Donald Glover — who snagged a Grammy Award earlier this year under his music moniker Childish Gambino — is seen strutting through a massive building shirtless and periodically shooting other black people, in an oddly choreographed fashion. Following a cheerful synchronized dance routine with uniform-clad school kids, Glover catches an AK-47 and opens fire on a group of gospel singers. 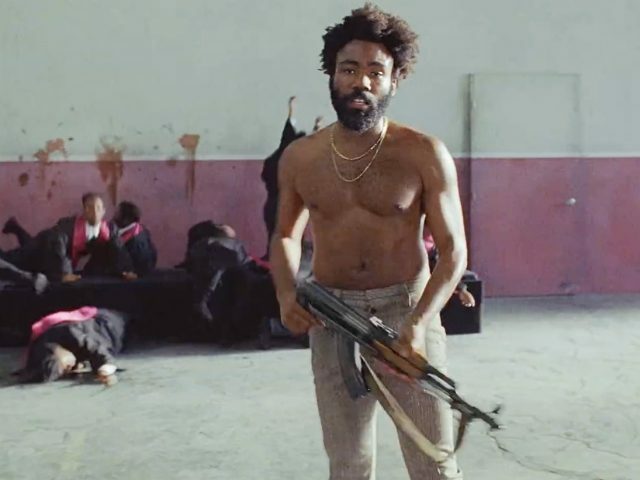 Childish Gambino music video for “This Is America,” YouTube 2018. The four-minute, which is being heralded by left-wing personalities like Keith Boykin and Shaun King, video is punctuated with Glover lighting what appears to be a joint and running away from a mob. The 34-year-old Golden Globe-winner debuted the song (and video) over the Weekend during his hosting and guest starring appearance on Saturday Night Live. The actor-rapper-comedian is set to make the red carpet rounds as he’s next to appear as Lando Calrissian in Solo: A Star Wars Story, which hits theaters May 25. Glover’s award-winning drama Atlanta is seeing solid viewership in its second season on FX. Glover’s tense new music video, however, isn’t his first flirt with political fare. While fielding questions in 2016 about his abrupt departure from the hit NBC comedy Community, Glover appeared to hope for the death of Donald Trump.